Reminder - It's Fast and It Looks Totally Hot! 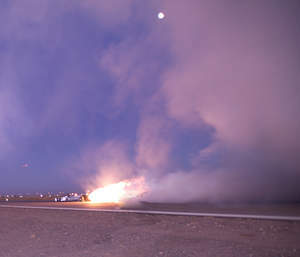 LAS VEGAS, NV -- (MARKET WIRE) -- November 6, 2006 -- The Air Force Reserve Jet Car masterfully rolls along the runway, spewing smoke, flames and mini-sonic booms. It pulls into position and waits. Sometimes a naive pilot, who actually thinks he has a shot at winning, flies close to the deck and issues a race challenge. The car continues to wait as the plane circles to get into position. The plane comes in fast and as it passes over the Jet Car, the driver kicks it into action. The Jet Car accelerates from zero to 400 mph in about eight seconds -- that's less time than it takes to dial home on your cell phone. It's less time than it takes to get in your car and crank the engine. It's less time than it takes to back out of your driveway. It's less time than it takes the Jet Car to zoom past the plane it is racing. You can actually witness the Jet Car take on another unsuspecting victim at the Naval Air Station in Pensacola on November 10 and 11. The Car's Westinghouse J-34 jet churns about 10,000 horsepower and 6,000 pounds of thrust to move the 26-foot long car, appropriately decorated to look like the inside of just such an engine. The 1800-foot run gobbles 40 gallons of diesel fuel before the 2,300-pound car is dragged to a stop by a ring slot parachute. Scott Hammack, who designed the Jet Car, is the primary driver, Bill Braack is the #2 driver and Linda Hammack handles logistics for the team, which has been accident-free for more than 3,300 runs. That equates to driving from New York to Ft. Lauderdale for Spring Break, and at Jet Car speed, that's about a three-hour trip, provided there's no traffic. Bill Braack, Scott Hammack and the Jet Car are proudly supported by the Air Force Reserve, composed of more than 70,000 men and women. Although members of the Air Force Reserve serve part-time, they perform approximately 30 percent of the work of U.S. Air Force. A large number of civilian jobs in America exist in the Air Force Reserve, where reservists can continue their careers while serving their country. The Air Force Reserve is a team of people who are stationed locally, but serve globally. The Air Force Reserve Jet Car will appear<br>at the NAS Pensacola Air Show on November 10 and 11.